Geothermal power plant at the Cove Fort-Sulphurdale geothermal area near the I-70 – I-15 junction, Millard and Beaver Counties, Utah. Amp Resources is proceeding with exploratory and development drilling in anticipation of reconstructing the plant into a 37 MW Kalina-cycle facility. 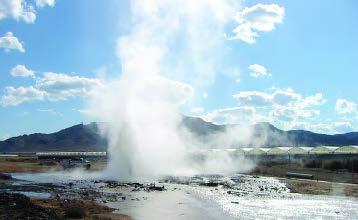 Utah possesses an abundance of untapped geothermal resources. Encouraging development of these resources is the main goal of the Utah Geothermal Working Group (Working Group). The Working Group, organized in 2003 as part of the U.S. Department of Energy’s (DOE) GeoPowering The West initiative, combines people from federal, state, and local governments; utilities; renewable energy advocates; geothermal industry; environmental organizations; landowners; and others interested in using Utah’s geothermal resources. Meetings are held two to three times annually at the Department of Natural Resources in Salt Lake City with the Utah Geological Survey serving as the coordinator. Membership is open to anyone. Since organizing in 2003 the Working Group has met five times and cosponsored two workshops focusing on geothermal direct-use applications and geothermal electric power development. Summaries of the meetings and workshops, as well as a position paper on geothermal energy development in Utah, are available on the Utah Geothermal Working Group Web site at http://geology.utah.gov/emp/ geothermal/ugwg.htm. Extends the 1.9-cent per kilowatthour production tax credit (PTC) for geothermal plants from five years to ten. 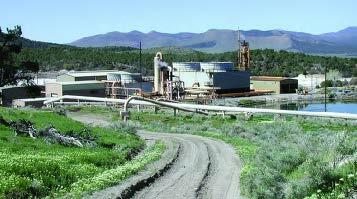 New geothermal power plants placed in-service by January 1, 2008, will qualify for the PTC. Authorizes Clean Renewable Energy Bonds (CREB) issued by municipal power authorities, rural electric cooperatives and other units of government, tribal authorities or non-profits for financing renewable power projects, including geothermal. CREB purchasers will receive federal tax credits in lieu of interest payments from the issuer. The Bureau of Land Management will offer federal geothermal leases every two years through competitive bidding. New regulations will base royalties on percent of total income. County governments will receive 25 percent of royalty income from federal leases. Geothermal direct use is encouraged by simpler leasing procedures, establishing a fee schedule instead of royalty payments, and allowing state and local governments to use geothermal resources for public purposes at a nominal charge. Future Power Plant at Cove Fort — Amp Resources began redevelopment of a geothermal power project at the Cove Fort-Sulphurdale geothermal area, southeast of the Interstate 15 – Interstate 70 junction near the Millard County-Beaver County line. Amp is in the process of exploratory-production drilling, and plans to dismantle the existing plant, formerly operated by Utah Municipal Power Agency. Amp’s objective is to build a 37 megawatt (MW) Kalina-cycle geothermal power plant at the site. Future Expansion at Blundell Geothermal Plant — Utah Power, a subsidiary of PacifiCorp, is considering expanding power production at their existing Blundell geothermal flash plant near Milford by constructing an 11 MW “bottoming cycle” binary power unit “downstream” from the flash unit. The addition of the bottoming cycle would bring the total capacity of the plant to 37 MW. Space and Water Heating at Utah State Prison — In January 2004, the Utah Department of Corrections in cooperation with Johnson Controls completed phase I of a geothermal space and water heating system for a 39,000-square-foot dormitory complex at the Utah State Prison near Bluffdale. Johnson Controls recently reported completion of phase II of the project, which includes space heat and domestic hot water to several other buildings, yielding a total area of about 250,000 square feet. The investment for both phases is $2,042,672 with a guaranteed annual savings in utility costs of $196,687. More information about the Utah Geothermal Working Group and Utah’s geothermal resources can be found through the Utah Geological Survey’s geothermal Web page at http://geology.utah.gov/emp/geothermal/. To join the Working Group contact Robert Blackett at robertblackett@ utah.gov, (435) 865-9035, or Nykole Littleboy at nykolelittleboy@ utah.gov, (801) 538-5413.